On May 18, 2013 over 250 students from both California University of Management and Sciences (CalUMS) and its sister school South Baylo University graduated and were awarded bachelors, masters and doctoral degrees. One of the most memorable segment of the graduation ceremony was the commencement speech delivered by Dr. Sukhee Kang, who served as mayor of the City of Irvine, California from 2008 to 2012. The speech as I referred to in a conversation with a friend later that day was a masterpiece. The delivery of the speech was flawless and it left everyone in attendance inspired and excited about the future. Upon request, Dr. Sukhee Kang accepted to meet with me and my objective was to draw from his wealth of experiences in order to reinforce his graduation message. 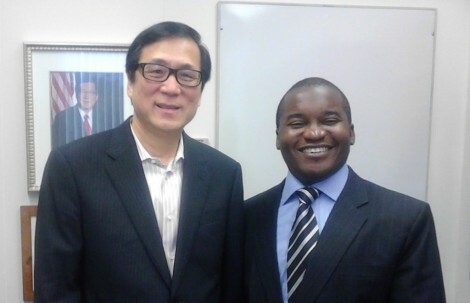 We met on May 30, 2013 at UC Irvine where Dr. Kang serves as Special Advisor to the Chancellor for South Korea Relations. The prerequisites to great achievements: respect people, value integrity, set clear personal goals, apply common sense. America embraces people from overseas as long as they perform and display a sense of decency. Learn from other who have been successful. The end result is what people care about. Be a good listener, follow through, and make things happen. Character building and self-confidence are very important. Politics is about serving people, align your vision with the people’s message. Convey the people’s message, not your own. Stand behind your policies 100%. Don’t be wishy-washy. Hard work is more valuable than talent. The world is always on the lookout for people with wealth of knowledge and real life experiences. You can learn more about Dr. Sukhee Kang from his Wikipedia page. I wrote an article for my university’s newsletter publication and I will update this post with a copy of the newsletter when it is released. In the meantime tell me which one of the nuggets above is your favorite and why?